They Say, "Water Always Wins"… At DRYmedic®, We Disagree. Home experts say “Water always wins” because water has a way of finding its way through even the smallest cracks. This means water damage can go undetected for weeks or even months, causing wood to rot and leading to serious structural damage. In a porous substance like drywall, mold starts to grow within 24-48 hours of water damage. The key to winning the war on water is to get help fast! 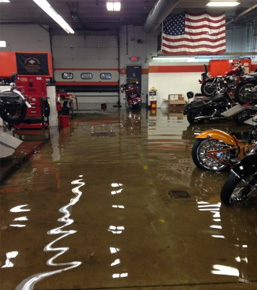 If you’ve experienced a flood, call DRYmedic first and avoid a bigger problem. Water damage restoration doesn't always mean tearing everything down. Our experts will assess the damage and consult with you on the process before we get started. We offer reconstruction to rebuild anything that has been destroyed by water damage. Additionally, if mold has already set in our team will quickly stop the spread and eradicate all the mold. We'll issue an “Emergency Work Order Agreement” that, once signed, will authorize us to perform necessary work and bill your insurance company. We do not collect any deductible owed at this time.